Clinical field experiences are essential components of teacher education programs. Though largely missing from most teacher education programs, cross-cultural field experiences aid teacher development by broadening their perspectives of diversity, teaching, and learning. This chapter explores the experiences of both preservice and in-service teachers who participated in a four-week intensive field experience in Cambridge, England. The Cambridge Schools Experience (CSE) curriculum emphasizes: 1) noticing and naming literacy practices, 2) deepening understandings of literacy teaching and learning, 3) being responsive in the moment, and 4) being a collaborative educator. Along with findings from the study, we discuss the program structure, as well as barriers to implementation and suggestions for overcoming those barriers to ensure program longevity. The clinical field experience is an integral component of many teacher education programs. Although the expectations and requirements vary between university programs, the experience typically involves preservice teachers observing and participating in a traditional classroom setting under the supervision of university faculty and experienced classroom teachers. Oftentimes, the structure of the program experiences and requirements are based around the needs of the faculty and university (Lawrence & Butler, 2010). During these experiences, preservice teachers have the opportunity to “learn by doing,” by applying educational theory and college coursework in context. Field experiences remain constant within the same public school district, or at times within the same school with occasional classroom changes. Research emphasizes the importance of early, diverse learning experiences in preparing potential teachers for the demands of teaching (Coffey, 2010). Recent literature suggests the significance of providing prospective teachers with coursework and experiences connected to community and culture to broaden their perceptions, beliefs, and attitudes of the many ways that learning takes place (Coffey, 2010; Hallman, 2012). 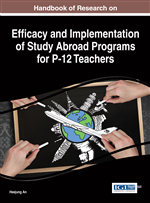 Extending teacher education programs’ commitment to preparing teacher candidates for environments that are not only part of schools, but situated within global communities, becomes a commitment to preparing beginning teachers for understanding that teaching and schooling extend beyond the walls of the classroom and into the world (Hallman, 2012). Missing altogether from many traditional field experiences is a more diverse, global, cross-cultural field experience. Basic university courses on multiculturalism do not adequately prepare preservice teachers with practical knowledge bases needed to instruct culturally diverse student learners (Evans, 2013). The National Education Association (NEA) asserts teachers must be equipped with the knowledge and skills necessary to develop global competencies in American students (NEA, 2010). As American society becomes more culturally and linguistically diverse and as global concerns and events continue to impact the economy, the environment, health and wellness, and education, it is imperative students develop global perspectives and competencies necessary to understand the impact of one’s actions, and to think critically about global issues, participate in positive solutions for global concerns, and appreciate cultural diversity (NEA, 2010). In order to prepare preservice teachers for a global community, teacher preparation programs must integrate global perspectives and competencies into coursework and field experiences. A cross-cultural field experience aids preservice teacher development by broadening their perspectives of diversity, multiculturalism, teaching, and learning (Cushner & Mahon, 2002; Dunn, Dotson, Cross, Kesner, & Lundahl, 2014; Kabilan, 2013; Phillion, Malewski, Sharma, & Wang, 2009). Alternative field experiences increase preservice teacher confidence, comfort, and self-awareness in knowledge of diverse families and their role in serving the community to improve instruction. The cross-cultural field experience exposes preservice teachers to global contexts. As a result, preservice pedagogical knowledge is transformed to include instructional practices for the cognitive development and academic success of diverse student learners. In this chapter, we discuss our experiences preparing preservice and inservice teachers in a cross-cultural field experience in Cambridge, England. We share our experiences utilizing co-teaching models with a literacy education focus, and describe what our research teaches us about these experiences, as well as ways to build from them. Literacy Teacher Education: Preparation of preservice teachers in the areas of reading, writing, speaking, and listening across all subject areas. Clinically Rich: A term used to describe teacher preparation programs that embed theoretical learning in K-12 classrooms, ensuring that field experiences support preservice teachers’ ability to make theory to practice connections. Co-Teaching: Two or more educators collaboratively working together to plan and deliver instruction to a group of students. Mentor Teacher: An experienced in-service teacher who provides mentorship, support, and modeling to preservice teachers while hosting them during their field experience. Literacies: A contemporary belief of teaching and learning that views literacy as central to all content areas. Global Competencies: Developing knowledge and appreciation of diverse groups and global contexts. Peer Placement: Pairing two preservice teachers with a mentor teacher, in a single classroom, during their field experience.